Make sure the hospital or nursing home’s name is entered on the requisition form. Cross matching facility is available for ascertaining blood group. The patient’s representative should bring the patient’s blood sample. 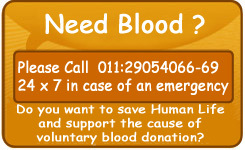 Before coming to the Bank, check out the latest availability of the particular blood product over the phone. It takes a few minutes to process a requisition. Wait. processing fee may have to be paid for the blood/ blood products. NO replacement donation is required. 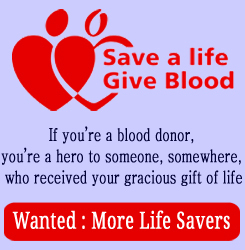 However, if your health permits, you are welcome to donate your blood to benefit another patient. This can be done on the same visit or at any future date. Each bag of blood carries a label, which gives information on the type of blood product, blood group, date of packing and date of expiry. The blood/ blood products should be transported in a cold chamber. This could be a thermocole or insulated bucket or bag packed with ice. Make sure the blood is not kept without refrigeration at any time.